If you like orange, you love life. 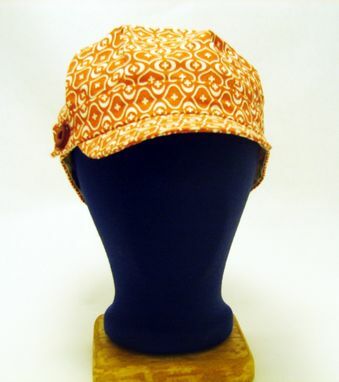 Display your lust for life with this bold hat. It is made in the style similar to a train engineer hat. Instead of white and navy stripes, it has an interesting orange and white print, on medium-weight cotton canvas. 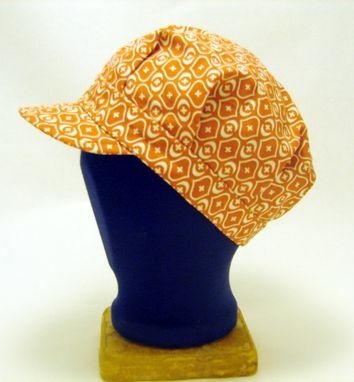 The bill is soft but stabilized with interfacing and the hat is not lined. If the bill gets wrinkly, ironing will flatten it and the shape of your head will curve it. The button on the right side is functional as well as decorative, and makes the hat adjustable. If it is too small or too big, remove the button and sew it where it will suit your measurements. I love clothes that fit! If you include your crown measurement in inches or centimeters in the "message to seller" at checkout, I will move the button for you, at no extra charge. For an example of where to put the measuring tape, look at the picture and wrap the tape around your head where you want the hat to sit on your head. 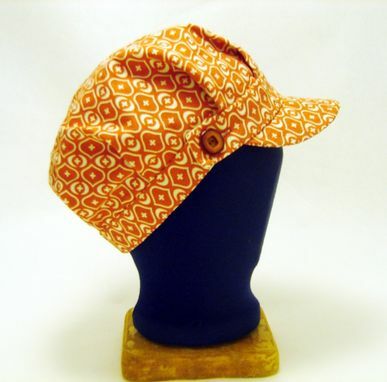 Some of the materials in this cap are upcycled. These are the interfacing, button, band lining and the thread. It is machine washable in cold water and machine dryable. I recommend line drying, and then ironing the bill.